“I grew up in Mexico and my Mom is one of the most amazing makeup artists I’ve ever met. She’s taken only one class but she is amazing. Where we grew up, she would do everyone’s makeup for weddings, parties, and big events – there would be an assembly line of women at my house before a big night out. She’s not a professional makeup artist but she’s naturally very good. She would experiment and try different products and I remember one time when she returned from vacation, she had these MAC jars of liquid liner in metallic blues, metallic orange, just the craziest colors. She would find a way to make you wear it and look normal. I was 15 at the time and she would put this stuff on my face and I wouldn’t look like a fool. My Mom is also one of those women who is very much into natural beauty. She never dyes her hair – it’s jet black – she picks the best features on your face and finds a way to elevate them, while never making you look too done. That’s something I’ve always tried to mimic. Trying to find a way to use makeup to enhance. My Mom taught me a million things. One, never leave the house without curling your eyelashes. I don’t know if that’s a Mexican thing or a worldwide thing, but I will never travel without an eyelash curler. My eyelashes, and everyone else’s in my family, grow straight down, so all of us are obsessed with eyelash curling. Two, always wear mascara. She also taught us tricks, like how to highlight your nose, to make a wide nose look thinner. Also, I’ve always had very low eyebrows and when I was 14 she taught me how to fill them in. Very small details like that, she taught my sister and I as kids. I also grew up with 2 incredible grandmothers and these women never leave the house without a full face on. I have never, ever seen them not perfectly done up – even at the supermarket. Makeup and looking done up is such a big part of their lives. My grandmother still comes to my house for lunch and my Mom will do a full face, eyelashes and everything. I’ve been playing around seeing what I like the best, makeup-wise. What I love are lipsticks and blush. Michael [Bastian] says I’m a blush girl and I do love a big pink cheek. I love it on everybody. I don’t like lipgloss, I don’t really use liners, I’m a pure lipstick girl. Blush and lipstick, I’ve found, are best suited for me right now. For lipsticks, I wear pinks and reds, and being really subtle on the rest of your face is a great way to give you that natural beauty but with a little more of a twist. I don’t get into oranges and other crazy colors. I stick to what my Mom taught me and that’s to be as natural as possible and to wear makeup to better yourself. I’m not a trend girl. I love to see it but I’m just not good with trends on my face. It’s funny because I work in menswear and I work with a man [Michael Bastian] who loves good makeup on a girl, so it’s made me use makeup more — in a good way. I know Michael loves it when I try to pull a look together and it’s made me try to work a little more at looking done up,to use eyeshadow and to play around with new products a little more. It’s the complete opposite, working with men instead of women, but it has made me want to wear and use makeup more than if it were the other way around. One thing I’ve found and that I’m obsessed with, is New York facialist Diana Seo. She owns the spa in the SoHo Grand Hotel. When I turned a certain age, I decided this was the one thing I’m going to invest in. I’m not a big product girl, I don’t buy and test new products. I find what works for me but I don’t go to the store to look and buy new products everyday. My one big investment was for my skin. I met Diana and she does facials but she also works with plastic surgeons for skin regeneration, and I do everything she says. I see her every two months, she works with my skin, she changes up the products I use, and she’s really become my guru. That’s the one thing I do without fail, anything she tells me. She’s turned me on to this product line called Priori and this stuff is amazing. There’s this sunblock I use from them called Radical Defense with environmental protection factor. My skin is really fair but when I tan, I get really brown – that’s when the Mexican in me comes out. So, I have to be super careful when I get in the sun. This sunblock that she gave me, is the best sunblock I’ve ever tried in my life. I only use it on my face but I can step out for hours and I won’t get burned. I live by this stuff. 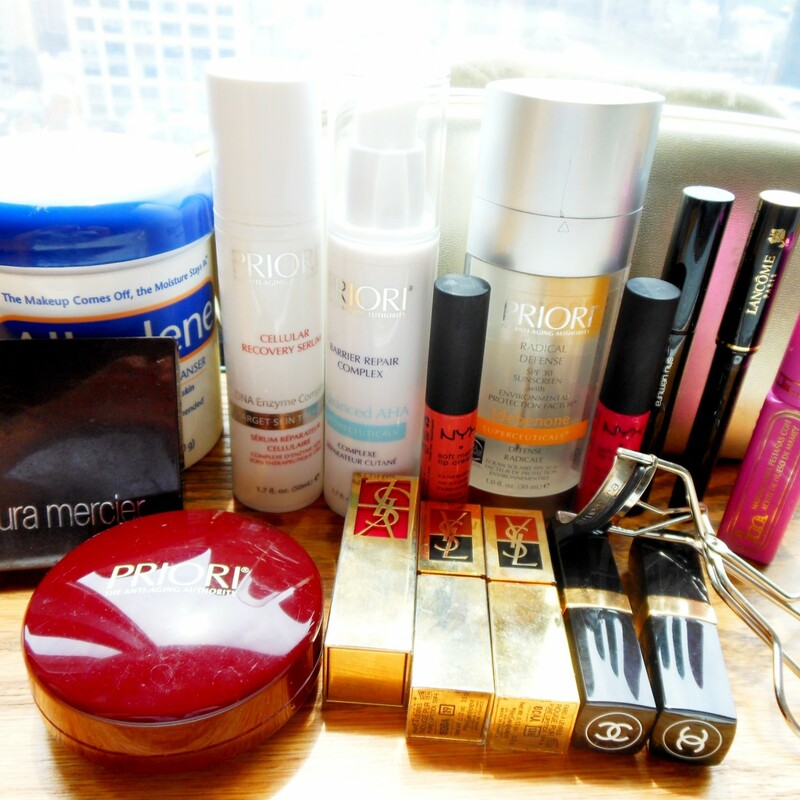 In the morning, I’ll wash my face with water, use a toner, and then from Priori I use their Cellular Recovery Serum. After the serum, I use their face cream, Barrier Repair Complex. So in the morning, it’s a whole ritual of toner, serum, and cream. I don’t use any concealer, I use this face powder which is really good. Diana turned me on to this stuff too and I didn’t want to try it but for my birthday she gave it to me, and she was like, “Stop whining. I want you to try it. If you don’t like, you never have to buy it.” Now I’m addicted to it. The powder is called, Priori CoffeeBerry Natureceuticals Perfecting Foundation. It’s a powder but it goes on as if you were wearing foundation. It covers all your spots, I don’t use a concealer or anything else and it has SPF. The idea of CoffeeBerry is essentially a powder to decrease dark spots, sun spots and it’s great for people with skin pigmentation problems. It’s a powder that comes with a special brush and you put it all over your face. It covers, protects with SPF, and corrects your skin. I really, really like it. I use Laura Mercier Illuminating Powder in Coral Red Quad and it comes off peachy pink after I mix all the colors together. I use it everyday, all day long. I also use the Pink Rose Quad, especially in the winter for a more pink cheek. The Coral I use in the summer time when I’m more tan. I found these while working at Bergdorf’s and it’s now been 7 years. I’m very loyal to this blush, I love Laura Mercier. On my eyes I usually do one simple, thin line – not quite a cat eye. I use the Lancome Artliner in black, brown, blue, and purple. The colors are super subtle, you can barely tell and they’re so easy to wear. They have a marker tip and it’s super simple to put on. One of the best tips my Mom taught me was to do your eyeliner with an eyeshadow instead of an actual eyeliner. It’s a million times less harsh and if you want that strong eyeliner feel, put eyeliner on and powder over with eyeshadow. The powder of the eyeshadow will fade into your eye and you’ll look a million times more natural. So I’ll do my liner and sometimes, I’ll dab a little eyeshadow in the same color over it. I use this Stila eyeshadow palette that I’ve had forever but it’s now discontinued. I have 2 mascaras that I use and because I have such straight eyelashes, all of the mascaras I’ve used over the last 15 years have always went from curl back to straight. I’ve only found 2 that work. One is Shu Uemura Precise Volume Mascara. I found this in a panic when my luggage was lost during Milan Fashion Week and I went to a store and had to try on 20 mascaras because none of them worked. This one held up. The other mascara that I’ve been using for 15 years is a Mexican one. It’s a natural, holistic mascara, made from a seed of a fruit. You can only find it in little supermarkets with the organic products in Mexico. It’s called Im Mascara Para Pestanas Con Aceeite de Hueso de Mamey. Mamey is a fruit and I don’t think it grows here in the US. It’s 22 pesos, which is equivalent to $2 and it’s amazing. It’s all organic and natural and it dissolves naturally when you remove it. I use 3 different lipsticks. One is YSL, Chanel, and NYX. For YSL, I use Fard A Levres Rouge Pur No. 19 and No. 139. They are both different versions of hot pink. I dab them on and blend them together and it’s a really nice subtle pink color, not a crazy hot pink. This is more of a night look. The Chanel one I love is another version of pink with red tones and it’s Rouge Hydrabase No. 98 in Splendeur. I wear this one by itself and it works a lot better for day. For a pure red lip and what I use to wear to ballet class, which is where I fell in love with red, strong lips, is Guerlain Geisha No. 23. I love this color for day or night. For day, I dab the red on my lip and use my finger to rub it in. It’s more like a tint or a stain. I did ballet for 15 years and either you love stage makeup or you never do it again. The one thing I did love about it were the super red lips. For NYX, I use the Soft Matte Lip Cream. It looks like a lipgloss but when you put it on, it goes on like a lipstick. This stuff is amazing, it’s $6 online. The color I use is Addis Ababa and every time I wear this lipstick, everyone always asks what lipstick it is. It’s another version of pink and it’s my go-to. The other color I wear is Antwerp, which is more of a peach. I don’t wear this one as much. These are mostly day but also great for night. Albolene Makeup Remover is 30 or 40 years old and it is one of the best things I’ve ever used. None of your eyelashes fall off, it looks like Vaseline, clear and a little gooey in consistency, but it takes everything off your face. No hard chemicals and if it goes in your eyes, it doesn’t sting. I use this every night.